Inspiring Art Teachers to Explore Art History | Curator’s Corner: It's Spring! Really, my sinuses are driving me crazy, and I’m yearning for SPRING. What better image to feature this week than springs? These poster stamps were an expedient way of advertising in the late 1800s and early 1900s (til about 1940). They were adhered to packages of ordered goods and they were also stuck on mass mailings. I find it fascinating that so much work went into the production of these small advertising pieces, as much as went into posters at the time. 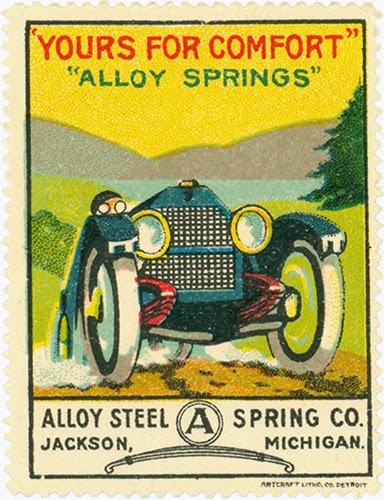 I realllllllllly like the repetition of circles in this stamp: Glasses on the driver, headlights, and wheels. It’s sort of dizzying. Studio Activity: Design a poster stamp. Invent a product and design a poster stamp (ideally make the design 5 ½" by 3”). Try and repeat shapes and colors. For instance, look at the repeated circles in the Spring Company stamp. Make sure to include vibrant colors to make the stamp draw the viewer’s attention.